Arduino has released a new 32-bit ARM based version of their popular microcontroller they call the Arduino Due. It actually has TWO Controller Area Network (CAN) controllers built into it - but no transcievers In a stunning second omission, Arduino Due provides NO EEPROM for persistent memory. You can't save variables from one power up to another. 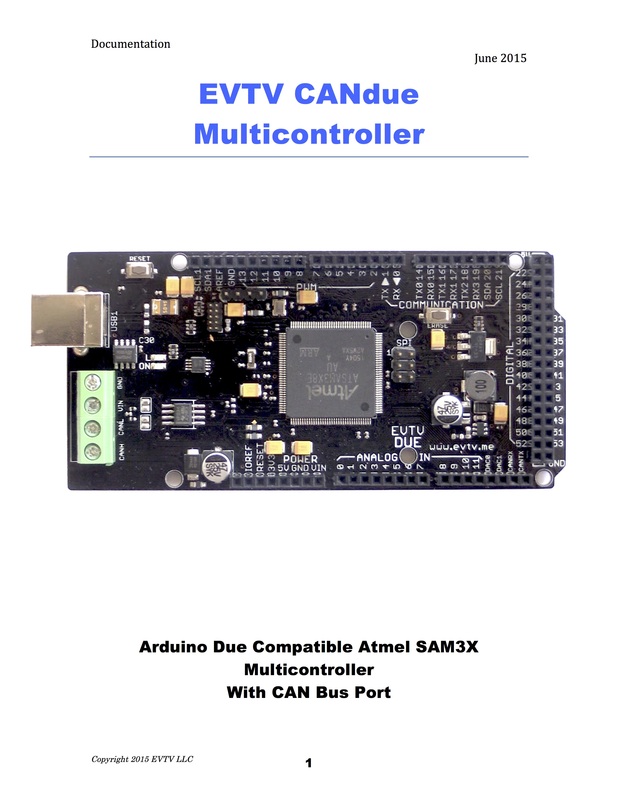 So we have commissioned our own version - The EVTV CANdue Microcontroller. This single board replaces the fragile micro USB connectors with a single strong Mini-B printer style USB port on the native USB port to the microcontroller. We've also added a 2Mbit EEPROM chip providing 256 Kbytes of persistent memory to save program data or configuration details. AND most importantly, a Texas Instruments CAN transceiver on the board to enable the CAN controller in the SAM3X microcontroller chip allowing direct CAN communications. The Atmel | SMART SAM3X/A series is a member of a family of Flash microcontrollers based on the high performance 32-bit ARM Cortex-M3 RISC processor. It operates at a maximum speed of 84 MHz and features up to 512 Kbytes of Flash and up to 100 Kbytes of SRAM. The peripheral set includes a High Speed USB Host and Device port with embedded transceiver, an Ethernet MAC, 2 CANs, a High Speed MCI for SDIO/SD/MMC, an External Bus Interface with NAND Flash Controller (NFC), 5 UARTs, 2 TWIs, 4 SPIs, as well as a PWM timer, three 3-channel general-purpose 32-bit timers, a low-power RTC, a lowpower RTT, 256-bit General Purpose Backup Registers, a 12-bit ADC and a 12-bit DAC. This example program allows you to use the EVTVDue CAN Microcontroller. It illustrates how to use the onboard EEPROM, and the CAN transceiver to send and receive CAN messages. Provides a good, and heavily commented starting point to develop more advanced programs for this device.